Bill Sheridan caught me in my session at the Winning is Everything Conference in Las Vegas last week. As a journalist, he has a knack of catching people doing what he thinks is “newsworthy” or meaningful. When I saw this on Facebook, as I was researching this post, it hit me that he actually caught the message of the entire Winning is Everything Conference. ROI = ROP. Your return on investment (ROI) will come from your return on people (ROP). Allen Koltin talked about it when he talked about the challenges facing today’s managing partners who feel pressured to keep earnings up as their colleagues head for retirement and find themselves under-investing in their next-gen leaders. Rebecca Ryan talked about it in her future trends and generational issues discussion. Leadership: A recent Harvard Business Publishing study found only 32 percent of business leaders believe that their organizations have the right leadership to achieve their strategic goals and cope with the current business environment. Learning: L>C, flipped classrooms, participation and engagement are the new normal. See my post, The No. 1 way to growth through technology. Technology: Hyper-connected, mobile, social, cloud, and Big Data. Generations: Generation gap, generation lap, and 2 for 1 (Boomers to Xers). Workplace: Work is no longer a place we go, but what we do — open, collaborative, and flexible. The shift change was the topic with which Rebecca Ryan started off our panel on future trends, featuring Andy Armanino (managing partner of one of the fastest growing firms in California), Gail Perry (editor of CPA Practice Advisor), Katie Tolin (president of the Association of Accounting Marketing) and your humble blogger, me (CEO of Maryland Association of CPAs and the Business Learning Institute, our innovation and learning center). The panel quickly focused on people issues, leadership, succession, and marketing as the major topics facing CPA Ffrms. There were plenty examples of firms that are making the investments and results are coming in — higher revenue growth, higher profitability, higher retention rates, and most importantly, engaged employees giving their discretionary efforts! The people issue and the difference between firms investing and those not investing permeated almost every session. Even the closing session by Orlando Magic owner Pat Williams focused on leadership and the importance of building strong and cohesive teams. Just read through the Twitter stream to see the emphasis and insights from the group about ROP. We believe the firms that approach these five major themes strategically and systematically will be the winners as the shift changes. Which brings us to our final point: ROI = ROP + RONI. That stands for the Risk of Not Investing (thanks to my association colleague at ASAE, Reggie Henry). The next time you are being asked, “What is the ROI?” ask them to consider the cost/risk of not investing, of being left behind. In this fast-moving and hyper-competitive environment, delaying decisions around the shift change is the same as not investing. The consensus at Winning is Everything is that this is dangerous to your firm’s future. ROI = ROP. 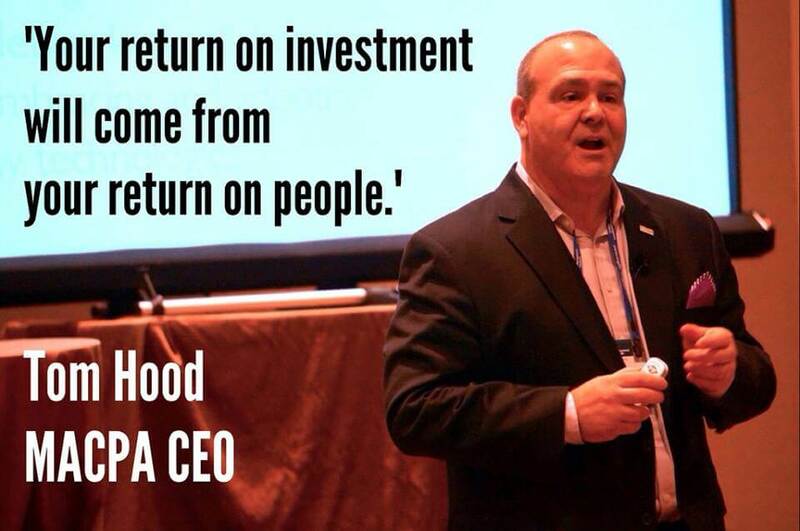 Your return on investment (ROI) will come from your return on people (ROP). And when you think about ROI, consider the RONI, the Return of Not Investing. Here is the set of photos from Bill on Flickr. Rita Keller did a post, Next Gen leaders based on the Twitter stream and my Slideshare deck. Here is my Storify recap, The High Perfoming CPA Firm.